1.Wide range of using in lighting equipment (LED equipment), automotive electronics, intelligent products, automation equipment and so on. 2. Energy products: large industrial power supply, aviation military communications. 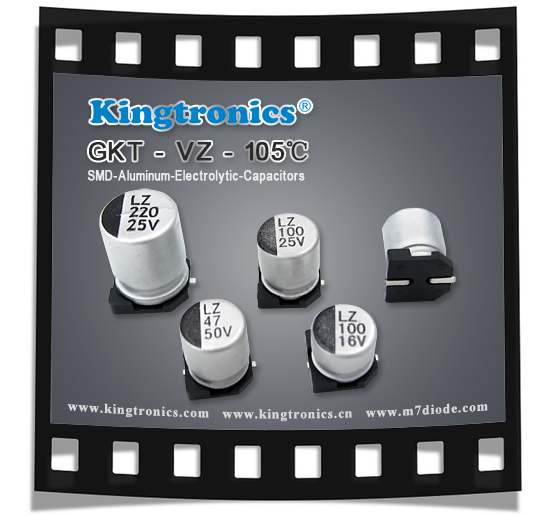 Kingtronics produce and sell a wide variety of Aluminum Electrolytic Capacitors with long life, low Impedance and excellent performance options. Welcome your inquiry for more information. When using Aluminum Electrolytic Capacitors, please observe the following points to ensure optimum capacitor performance and long life. 1>DC electrolytic capacitors are polarized. Make sure of the polarity which is marked on the body of the capacitor. Application of the reversed voltage may cause a short circuit or damage to the capacitor. Use bipolar capacitors when the polarity is not determined or unknown. Note that DC electrolytic capacitors CAN NOT be used for AC application. These capacitors are used only in pulse circuits as well as polarity reverse circuits, but not applicable in pure AC or high ripple current. If a voltage exceeding the rated voltage is applied, the leakage current will increase, which will damage the capacitor. Recommended working voltage is 70% - 80% of rated voltage. Using capacitors at recommended working voltage prolongs capacitor life. The flow of ripple current greater than the permissible (rated) value will cause heating of the capacitor, which may decrease the capacitance and damage the capacitor. Ripple current through the capacitor must be at or below the allowable level, generally not more than 80% of the rated current. 5>Use specially designed capacitors for the circuits where charge and discharge are frequently repeated. In circuits subjected to rapid charge and discharge cycles, a capacitor may be damaged and its life may be shortened by capacitance decrease at higher temperature. The characteristics of capacitors change with the operating temperature. The capacitance and leakage current increase and dissipation factor will decrease at higher temperatures. Usage at lower temperature will ensure longer life. The expected life of a capacitor is related to its ambient temperature. Generally, if the ambient temperature is reduced 10℃, life is doubled at rated voltage. Electrolytes usually have their capacitance measured at 100 Hz. or 120 Hz. However, remember that capacitance decreases and dissipation factor increase as the applied frequency becomes higher. Long periods of storage have virtually no effect on a capacitor’s capacitance and dissipation factor. However, such periods can increase leakage current and decrease the capacitors withstand voltage. Apply rated DC voltage treatment to the capacitors which have been stored for a long time. 10. The capacitor case is not insulated from the cathode terminal. The capacitor’s case and cathode terminal connect through the electrolyte. If the case is to be completely insulated, that insulation must be at the capacitor’s mounting point. 11. Do not apply excessive force to the terminals and leads. An excessively strong force applied to the terminals and lead wires may cause leads to break or terminals to separate and, in turn, cause the internal contact to fail. 12. Cleaning of the circuit board after solder dipping. Clean circuit boards to remove flux or other extraneous matter. To ensure protection for the sleeve, its marking, and the capacitor's sealing materials, the capacitor should never be washed or cleaned by halogenous agents or solvents such as trichlorethylene, xylene, acetone, etc. Recommended cleaning solvents; Methanol, isopropanol ethanol, isobutene, petroleum ether, propanol and/ or commercial detergents. 13. Be cautious of the temperature and duration when soldering. Soldering irons should be kept away from vinyl-insulated sleeves of capacitor. When the capacitor is dipped in a solder bath, use at less than 260℃ and 10 seconds to avoid damaging the capacitor. 14. Hole positions on the circuit board. When designing a circuit board, space the through-holes equal to the space between the capacitor's lead wires. If the spacing is either greater than or less than the capacitor's leads, mounting will apply stress to the leads, causing short circuits, broken circuits, and increased current. Also, through-holes on the circuit board as well as lead holes of post-process parts can result in solder splashing onto the vinyl sleeve causing damage. 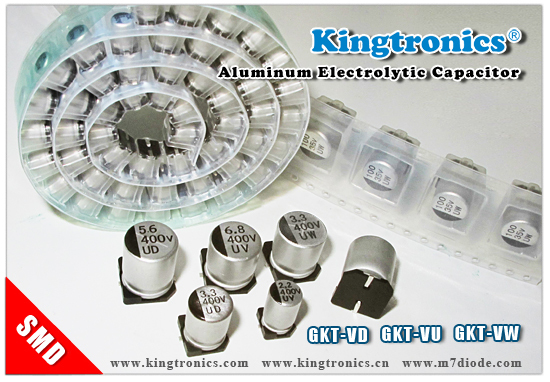 Kingtronics began to sell Aluminum Electrolytic Capacitor to overseas market in year 2016, before that, we sold to Chinese mainland and Hong Kong over 10 years with good reputation. Recently the result proves our strategy is correct, now more and more oversea customers give us positive good feedback for price and quality, and place order to us. Some of our distributor voluntarily help promote our brand E-cap on exhibition, we believe we also can bring profit to your company and support you in your market. We expand E-cap production line for more specification to meet our customer’s difference requirement. Below our SMD E-CAP product series and specification, welcome feel free to check our product datasheet and send your inquiry to us, let us do best to support you. 1. The capacitance per unit volume of aluminum capacitors is particularly large, the lower operating voltage, this feature is more outstanding. 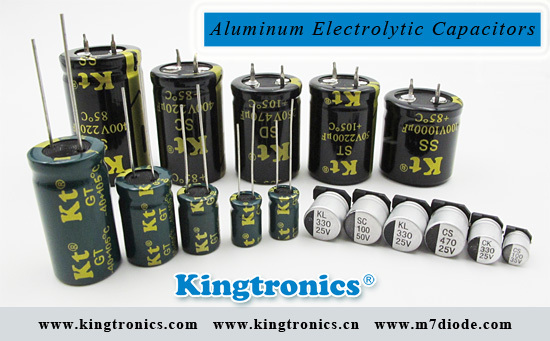 Therefore, the aluminum capacitors is particularly suitable for miniaturization and large capacity of the capacitor. It is noteworthy that its small size, light weight, volume and weight only about 1/10 of the traditional components. 2. 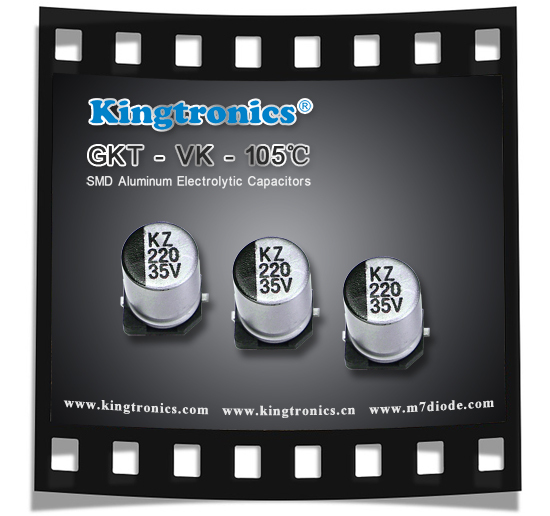 Kingtronics SMD Aluminum Electrolytic Capacitor has best in class high-frequency performance, it can reduce the interference of electromagnetic and radio frequency. 3. 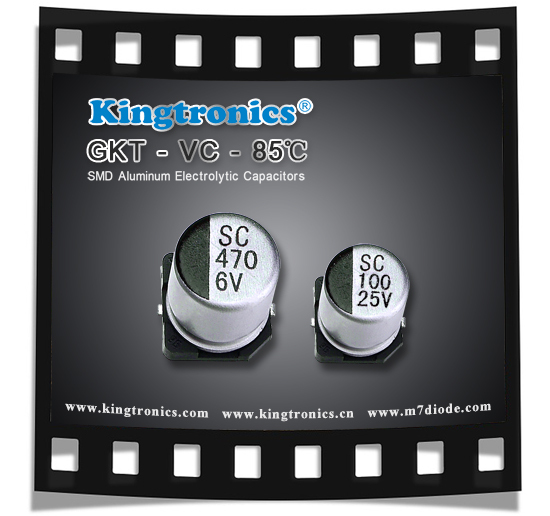 Kingtronics SMD Aluminum Electrolytic Capacitor is easy to achieve automation and improve production efficiency. It not only reduces 30% to 50% of the cost, but also saves material, energy, equipment, manpower, time and so on. 4. 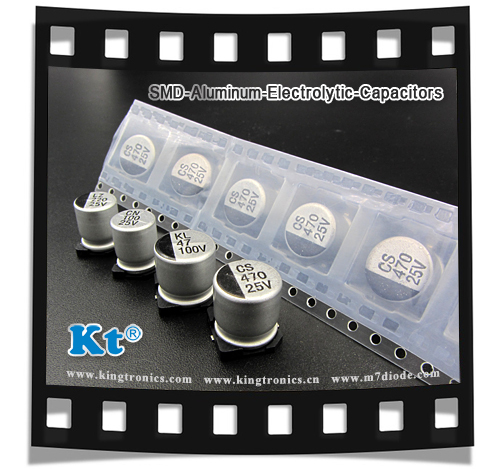 The defects of the SMD Aluminum Electrolytic Capacitor can be repaired at any time during the working process and restore its insulation capacity. Besides, the dielectric oxide film of the Aluminum Electrolytic is able to withstand very high electric field strength, this is more than 30 times the paper capacitor. 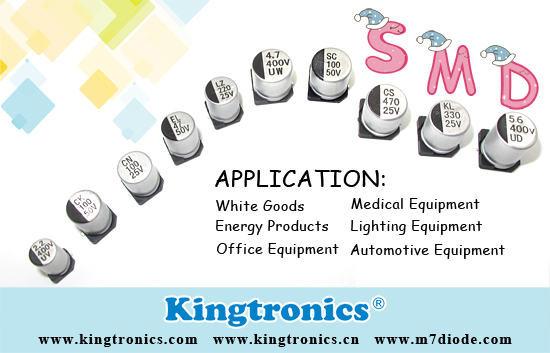 Do you know about the application of Kingtronics SMD Aluminum Electrolytic Capacitor? I would like to tell you something about it. With the advancement of modern technology and the continuous improvement of capacitor performance, owing to its small size, big storage power and highly cost effective, V-Chip Aluminum Electrolytic Capacitor is widely used in consumer electronics, communications products and peripheral products, new energy, automotive industry and so on. 1. It applied to in-vehicle electric equipment, and also can support the anti-vibration type. 2. It is used in high-definition television, including digital set-top boxes, LCD, car DVD. 3. DC-link capacitors in AC/DC converters for variable-frequency drive and frequency changers as well as in uninterruptible power supplies. 4. Energy storage for airbags, photoflash devices, civil detonators. 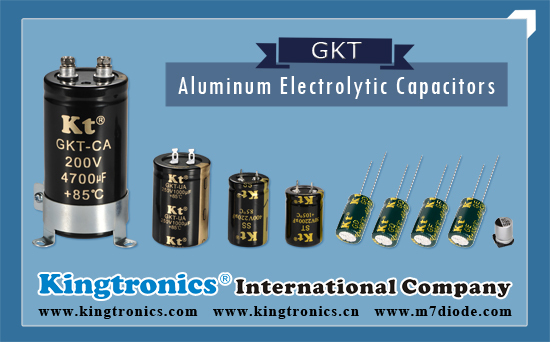 Aluminum Electrolytic Capacitor is inexpensive capacitor with high capacitance values for filtering lower frequencies. Our products are very great diversification in styles, series with tailored lifetimes and electrical parameters. 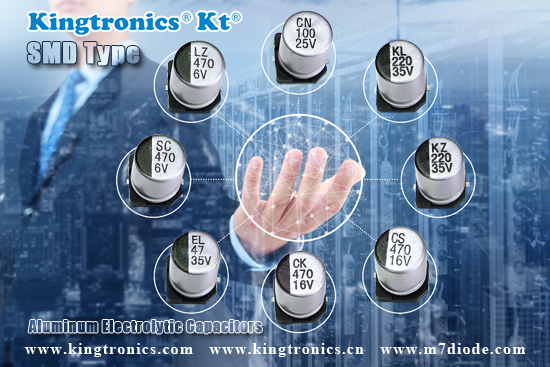 GKT-VZ is Kingtronics excellent product, you must be satisfied with it. We are willing to recommend our high quality products to you! 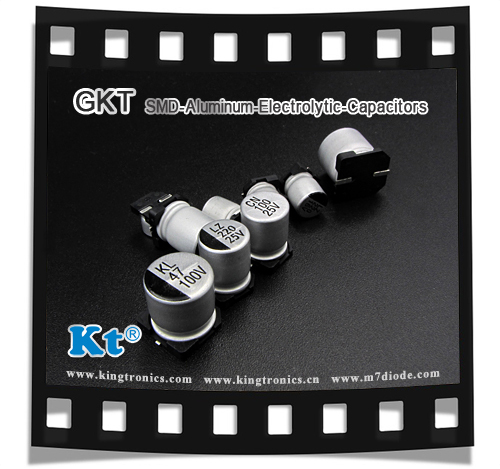 Kingtronics has very competitive price of Kingtronics GKT-VK SMD E Cap. its quality is guaranteed and trustworthy. We have built a long-term business relationship with lots of customers around the world. You can rely on Kingtronics!